As consumer demand for fish continues to grow worldwide, scientists are working to address some of aquaculture’s most persistent challenges. “There are a few bottlenecks and hurdles that the industry needs to address,” says Yonathan Zohar, professor and chair of marine biotechnology at UMBC. He and Ten-Tsao Wong, assistant professor of marine biotechnology, are working to address two of those hurdles: fish escaping from net pens and dying of disease. Wong and Zohar recently received $670,000 of a $740,000, three-year grant from the National Oceanic and Atmospheric Administration to support their research. The remaining $70,000 will support the Maryland Sea Grant’s outreach and education efforts related to improving aquaculture. UMBC faculty at the Institute of Marine and Environmental Technology, a multi-institution facility on Baltimore’s Inner Harbor, are perhaps best known for their groundbreaking work raising marine fish on land. Their current NOAA-supported research has a different focus—tackling challenges in offshore aquaculture, where fish are grown in net pens in the open ocean. 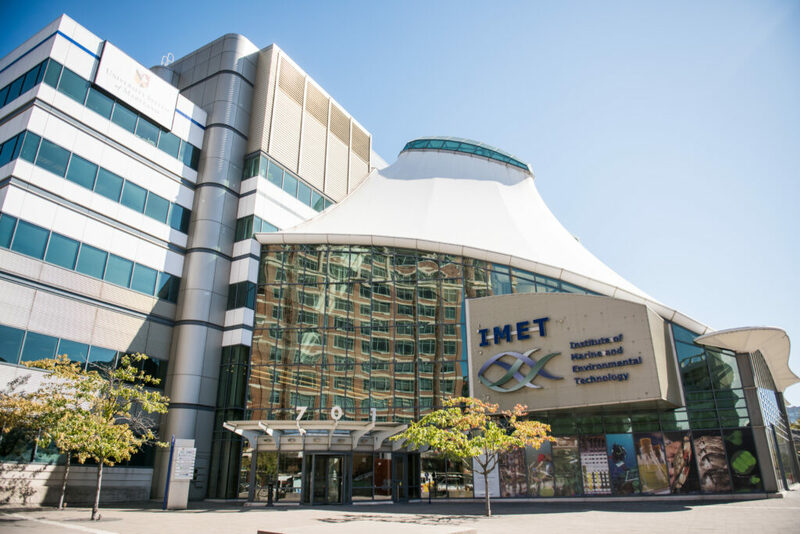 The Institute of Marine and Environmental Technology. Photo by Marlayna Demond ’11 for UMBC. In addition, some of the most popular commercial fish, such as salmon, reach reproductive maturity before they reach market size. Once reproductively mature, a fish’s growth rate slows because some of its energy is diverted toward developing reproductive organs, and therefore away from growing muscle. On top of that, reproductively mature fish tend to produce lower-quality meat, making them less valuable on the market. They also have weakened immune systems, so they’re more susceptible to disease. This is a major issue when fish are raised at high-density in pens exposed to potential pathogens in the ocean. In response to these problems, Zohar and Wong have invented a technique to grow fish that cannot reproduce. This would solve the escape problem, because if sterile fish escape a net pen, they won’t be able to mate with wild fish, so they can’t alter the wild population’s gene pool. And sterile fish address the reduced performance of reproductively mature fish, too, because without their energy going toward developing reproductive organs, they don’t suffer from a slower growth rate, muscle deterioration and disease the way fertile fish do. Some methods do currently exist to produce sterile fish, but they aren’t very practical for the rapidly expanding aquaculture industry. For example, scientists can produce triploid fish—fish with three, instead of two, copies of every chromosome. These fish only grow well in absolutely perfect conditions. Also, modifying the number of fish chromosomes may present regulatory hurdles and can repel potential consumers. “Everybody has been looking for another way to develop reproductively sterile fish,” Zohar says. Rather than altering a fish’s genetic code, Wong and Zohar created a new method that prevents a fish embryo from producing a particular protein necessary to develop reproductive organs. The process temporarily silences the gene that codes for this protein, called deadend, during a critical one-to-two week window of development. The gene’s sequence remains unaltered, however, so the fish isn’t a GMO. Wong (right) and Zohar observe rockfish in a tank at the Aquaculture Research Center at IMET. Photo by Gary Jones. Previously, this new method was found to be effective, but required every fish to be injected individually with the silencing compound. “If you consider the industrial scale, injection is way too much work to do,” Wong says. With this in mind, Wong and Zohar set off to improve their approach. In Wong and Zohar’s new method, fish embryos are bathed in a solution containing the silencing compound at the critical time during development. They have found the solution to be much faster, cheaper, and simpler than the injection method. Because the solution is applied well before producers place fish in net pens, it also doesn’t risk exposing wild populations to the silencing compound. Previous testing showed that the technique works in zebrafish, a small freshwater fish commonly used in research. Now it has also been implemented in the commercially important Atlantic salmon and rainbow trout. The main goal of the current work is to optimize the process. In previous experiments, 84 percent of rainbow trout that received the treatment grew up to be sterile. Wong and Zohar would like to see that number climb. They are also partnering with the USDA to conduct a performance study of sterile fish, testing whether or not they grow faster than fertile ones. “It will help us to prove the case that these fish are going to be more cost-effective,” Wong explains. “We have done so much already,” Wong says, “and in three years’ time, we hope it’s going to be an optimized commercial protocol.” That would be a win for the aquaculture industry, oceans, and fish consumers worldwide. 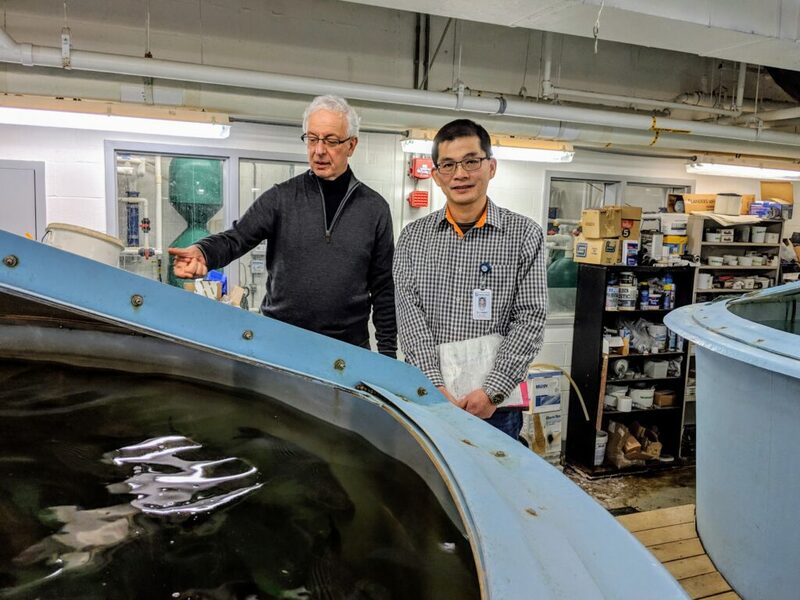 Image: Ten-Tsao Wong (left) and Yonathan Zohar at the Aquaculture Research Center. Trays for incubating salmon eggs are on the left. Photo by Gary Jones.